Our first ever! Lots of prep, but it’s hopefully well worth it all. 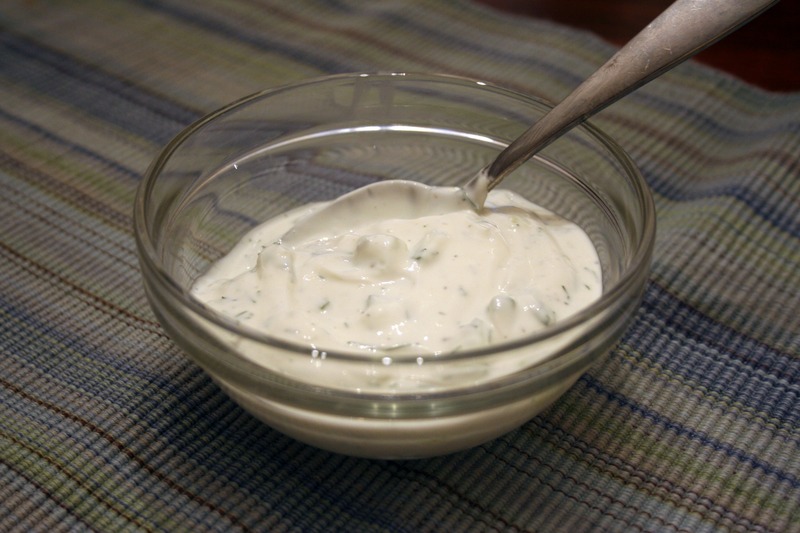 I made Greek dressing, tzatziki sauce, and marinated the chicken souvlaki. 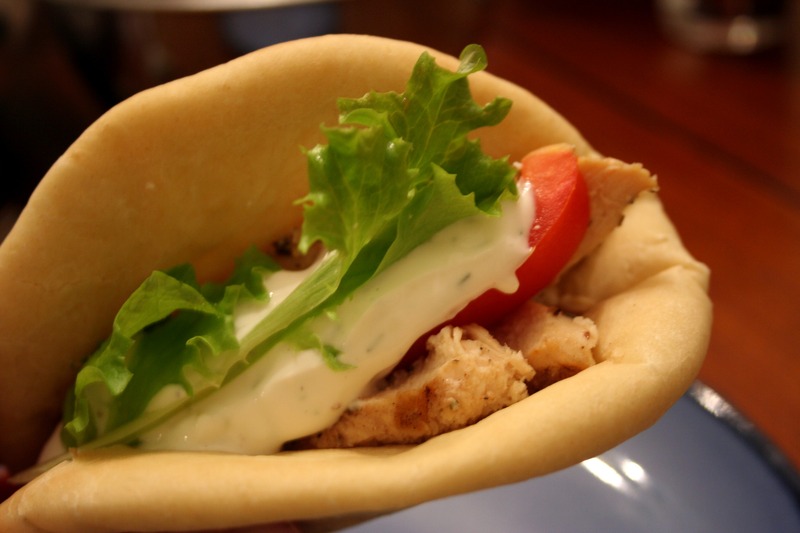 Oh – and I decided to make the pita bread to eat the chicken like a gyro. I love making bread especially different types like this one. The recipe is super simple with one rise lasting an hour, shaping then a rest of 15 minutes. They baked up really quickly too – just make sure your oven has preheated for at least 20 minutes. Anyway, this dinner turned out fantastically which is always the desired outcome – especially when it’s my first try! The chicken flavorful, moist and juicy; the tzatziki sauce was creamy, garlicky and perfect with the gyros and the pita bread was a hit too. I bet the leftovers will be even tastier. Whisk together garlic, oregano, olive oil, lemon juice, salt and pepper. Combine the marinade with the pork in a large freezer bag. Marinade in the refrigerator for at least 24 and up to 48 hours. Rotate the bag to redistribute the marinade at least twice during this time. Preheat the grill to medium high heat. If you are using wooden skewers, soak them in water before using, or use metal skewers. Thread about 5 pieces of meat onto each skewer, enough for one serving. Grill the skewers for about 15 minutes, turning two or three times. The chicken will take less time to cook than the pork, so start checking for doneness at about 10 minutes. 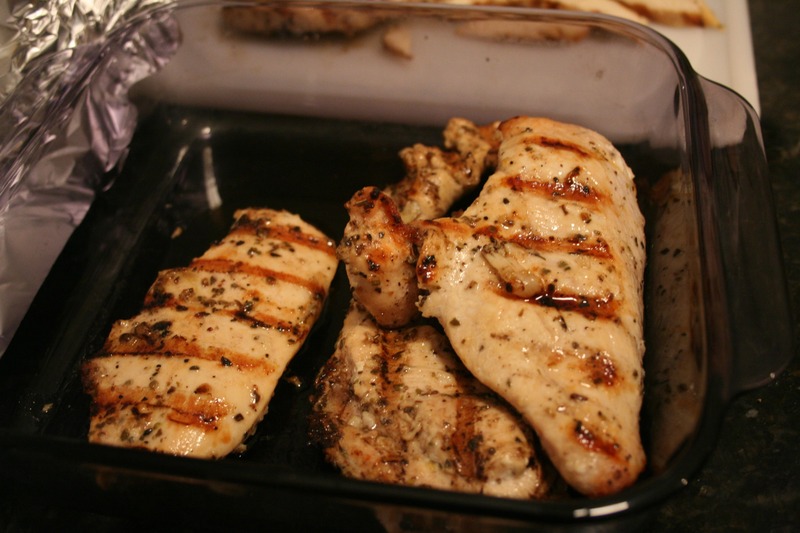 The meat should register about 150°F for the pork and 160°F for the chicken when you take them off the grill. Let rest for 5 minutes before serving. Because of the marinade ingredients, the meat (both the pork and the chicken) may still be slightly pinkish inside even when fully cooked. 1. Combine all of the ingredients, mixing to form a shaggy dough. 2. Knead dough, by hand ( 10 minutes ) or by mixer ( 5 minutes ) or by bread machine ( set on the dough cycle ) till it’s smooth. 3. Place the dough in a lightly greased bowl, and allow it to rest for 1 hour it’ll become quite puffy, though it may not double in bulk. If you’ve used a bread machine, simply let the machine complete its cycle. 4. Turn the dough onto a lightly oiled work surface and divide into 8 pieces. 5. Roll two to four pieces into 6″ pieces ( the number of pieces depends on how many rolled-out pieces at a time can fit on your baking sheet ). 6. Place the circles on a lightly greased baking sheet and allow them to rest, uncovered for 15 minutes, while you preheat the oven to 500 degrees. ( Keep the unrolled pieces of dough covered. Roll out the next batch while the first batch bakes ). 8. Transfer the baking sheet to your oven’s middle-to-top rack and bake for an additional 2 minutes, or until the pitas have browned. 9. 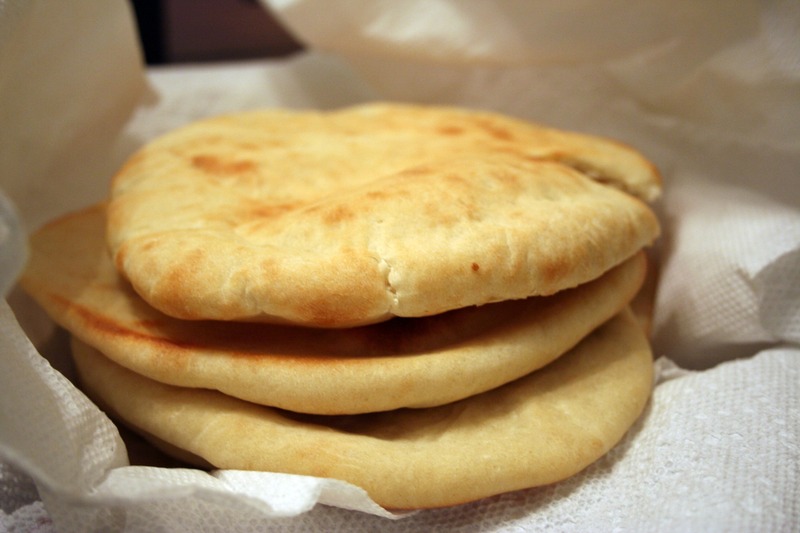 Remove the pitas from the oven, wrap them in a clean dishtowel ( this keeps them soft ), and repeat with remaining dough. 10. Store cooled pitas in an airtight container or plastic bag. 🙂 thanks – it tasted even better! Thanks for trying my recipe. You’re pitas look great!